A bite splint is a plastic appliance worn at night by patients who clench and/or grind their teeth during sleep. Many people crack or chip their teeth. This can result in needing dental fillings or crowns. Over time, the teeth will begin to show occlusal, or biting surface, wear. It is not uncommon to see that a patient has worn through the outermost layer of tooth, the enamel, and into the second layer, dentin. Wearing through the protective layer of enamel and exposing the dentin can often cause sensitivity. Clenching and grinding also causes gum recession. Gum recession is when the gum pulls away from the crown of the tooth and exposes some of the root surface. The root surface is not covered by the hard, protective shell of enamel. Therefore, when we have gum recession we are directly exposing the dentin layer, often resulting in tooth sensitivity. Wearing a bite splint at night helps to protect the teeth from the issues listed above. It also aids in relaxing the jaw joint, reducing many TMJ problems associated with clenching and grinding. 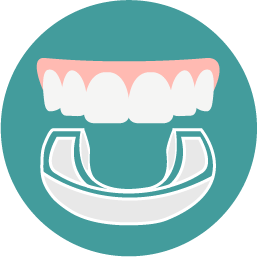 The bite splint we offer is custom-fit and made to be worn over the top teeth. The first appointment is short and sweet. Impressions are taken of the top and bottom teeth. Next, a bite registration is taken. This is a type of dental impression that shows how your teeth naturally bite together. These impressions are sent to our dental lab, where the bite splint will be made. You will return to our office after the bite splint is complete. At this time, Dr. Seneczko will adjust the bite splint so it fits comfortably. Any special instructions or advice will be given at this time. Sometimes more than the initial adjustment is needed, as you grow accustomed to wearing the bite splint. If so, a simple 30-minute appointment usually takes care of this.